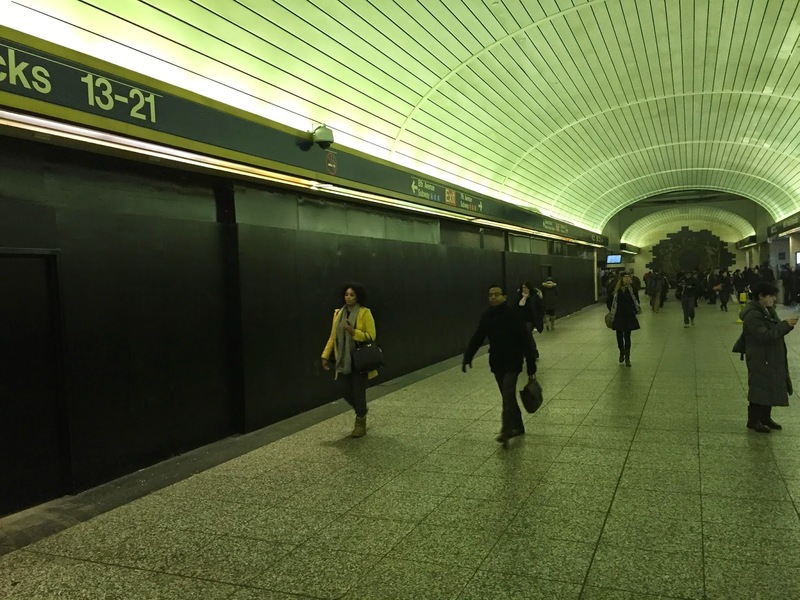 Have you ever been hungry in Penn Station while waiting for the train? Yes? How unfortunate. Why? Because Penn is the worst place in Manhattan to be when you need something to eat. Penn's choices make me choose hunger 82.9 times out of 100. The other 17.1 times, I've regretted the indulgence. Let's look at what Penn has to offer. 1. Pre-processed garbage snacks. If salty snacks are your thing, you are probably wondering what I'm making a fuss about. Pretzels, potato chips, and candy abound at Penn. You can walk up to pretty much any newsstand and have your pick of junk. Problem is, those empty calories leave you feeling lousy. By the way, I'm not a nutritionist, nor do I have any affiliation with any nutritionist whose ad should pop up on the page you're reading. That reminds me, you should know that I don't choose the site ads you see. They're served based on your web viewing habits and the text you're reading. In lieu of asking for donations to keep the site running, I ask you to look at the ads and more importantly, click on them. Each click puts MILLIONS in my pocket. Ok, each click puts pennies in Google's pocket until I reach an absurd threshold of clicks. Once reached, Google sends me a handsome sum. While I don't want to brag or crassly talk about money, let's just say that when I eventually reach the threshold, non-premium drinks are on me for 20 minutes. Sorry, I'm digressing from the topic. I tend to do that. Let's get back to the great food choices at Penn Station. 2. Au Bon Pain. How does this place stay in business at Penn? Who wants to get a huge cup of soup to take on the train? 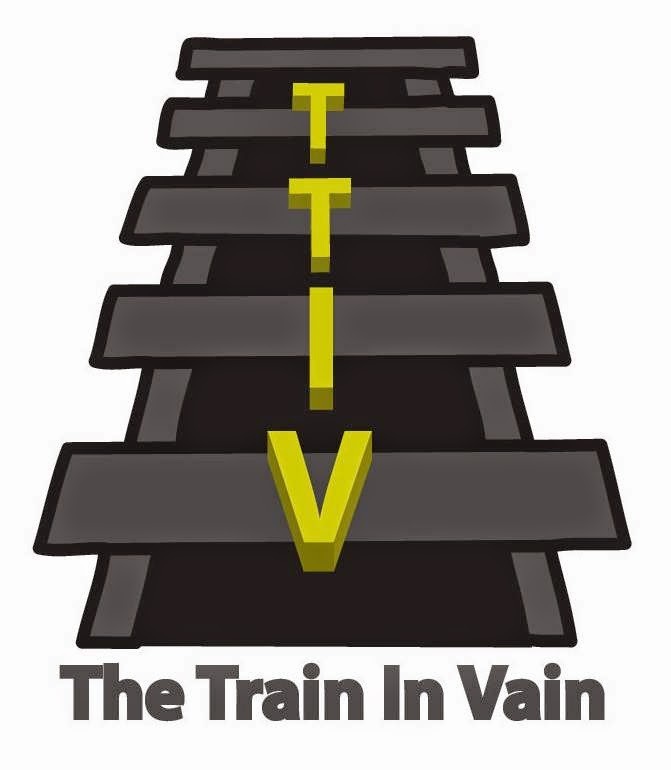 You'll be wearing most of it before you even get out of the tunnels into Queens. Their sandwiches? Meh. Their coffee? Weak and lukewarm. 3. Subway and McDonalds. Guilty pleasures for certain, but I rarely touch the stuff. Have you seen those news reports where they show how processed chicken is made with pink slime? I don't understand how something that looks like liquefied cotton candy ends up resembling chicken. With grill marks. Just thinking about it should provide anyone with gumption to resist the temptation. 3. Rose Pizza. The one morsel of gastronomic hope. Rose has decent pizza and a large seating area. They're highly accommodating to both commuters and homeless people alike. 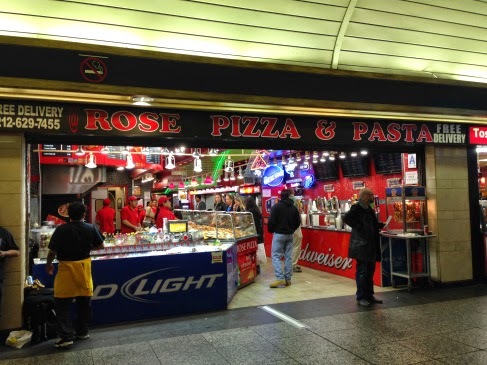 Rose also has a bar for commuters on the go, "manned" by scantily clad young women. The tip jars are always full, which makes sense because scantily clad women are well known for providing excellent service. 4. Hot and Crusty. I can't bear to walk in the place. The name makes me consider getting a penicillin prescription. 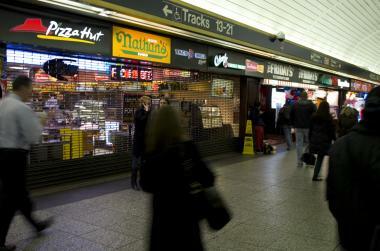 Vornado Realty has shut down some of the fast food joints like Pizza Hut, Nathan's, KFC, etc. and is in the midst of replacing them with high end restaurants. That's all well and good, but they're forgetting the critical fact that Penn Station is a dump. No one wants to make it a destination for a high end dining experience. The restaurants themselves may turn out nice, but then customers will have to exit into Penn Station. Perhaps I have no vision. Perhaps the new upscale restaurants will do well and I don't know anything. But my guess is that these places will have a hard time finding a crowd. People on expense accounts want to impress clients with pleasant surroundings. And Penn ain't Grand Central Terminal. So with that, I'll hold out on getting something to eat, and say good luck to the new steakhouse or whatever is going to open in the space on the 7th Avenue side. If they have problems attracting visitors, I'd suggest the waitstaff invest in tank tops with plunging necklines.